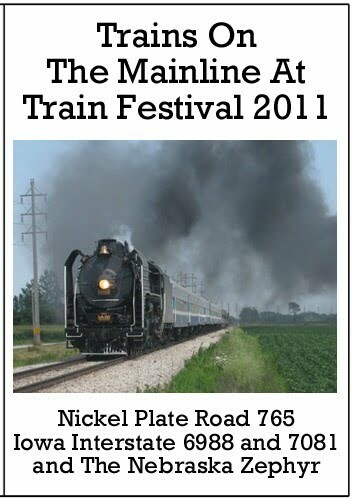 Three mainline steam locomotives and a 1936 articulated diesel streamliner are the stars of Train Festival 2011. Rock Island, Illinois is the host city. This event also had some vintage diesels present. The featured engines are chased across three states. Film source Kurt Jensen, is a fine cameraman. He is with Diverging Clear Productions. Kurt performs the narrative in this show. The main menu contains: scene selection, bonus footage and previews. Mary McPherson is the producer and writer. 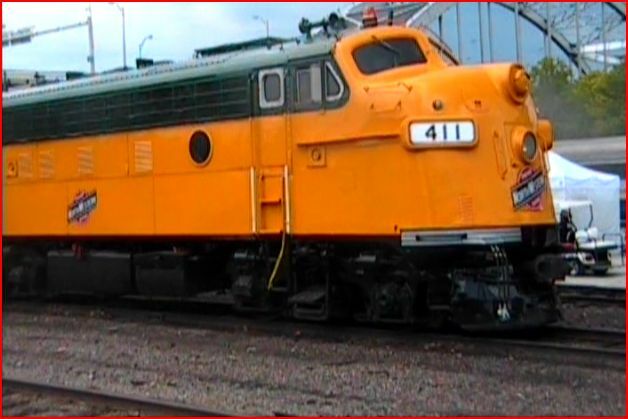 Chicago & NorthWestern F7A #411. Looks good in classic CNW livery,. 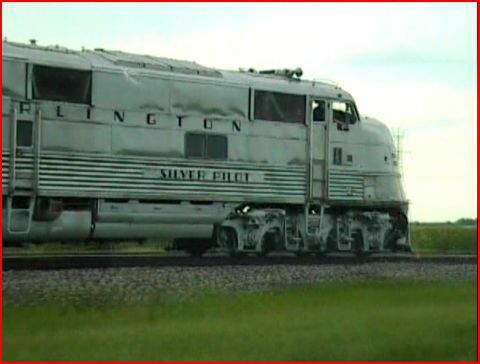 The F7 was among a group of static display locomotives. Multiple locomotives and different consists create much interest. Kurt has filmed numerous moves, within and surrounding Train Festival 2011. There is quite a bit to see. Really would have liked some map references. Where did that TP&W actually run? 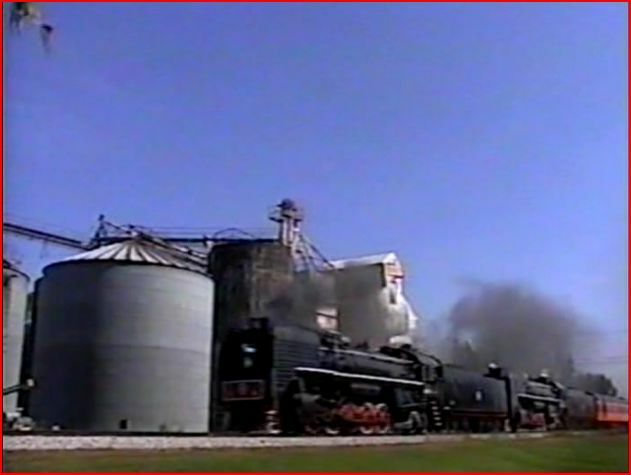 Iowa Interstate had imported the two Chinese steamers in 2006. Class QJ 2-10-2 .Later in the show, one of these having an Americanized exterior. Both have different, custom built steam whistles. The reproduction of the Southern whistle gets my vote. What’s yours? Nickel Plate 765 is one of the famous Berkshire 2-8-4. High Speed Service was the road’s slogan. The venerable engine will be speed restricted to 10 mph, for much of the move. Extreme heat caused the speed reduction on TP&W trackage. Loganport, Indiana. Iowa Interstate’s doubleheader is pulling a 55 car freight train! 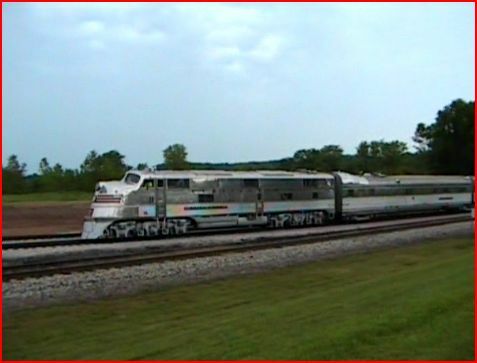 Totes a GP38-2 near the end of the train. Two custom replica whistles set the twins apart. Lead unit is now sporting the Americanized appearance. 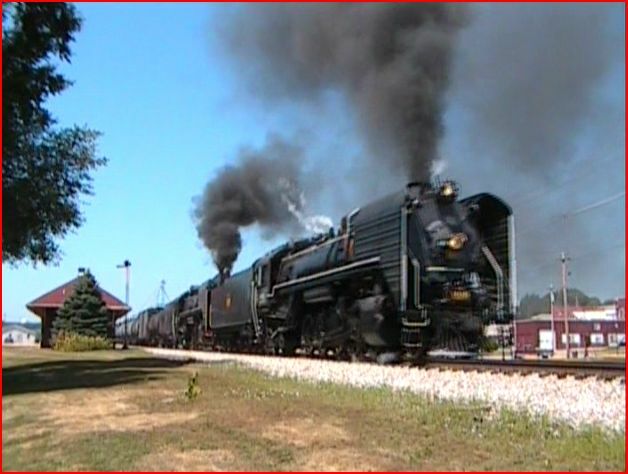 The single visor headlight, black tires and those smoke deflectors remind me of New York Central. It has an Illinois Central steamboat whistle. A must hear, this whistle sounds strange. More like a tugboat. It is loud! That low tone shows up on Crab Orchard & Egyptian #17. 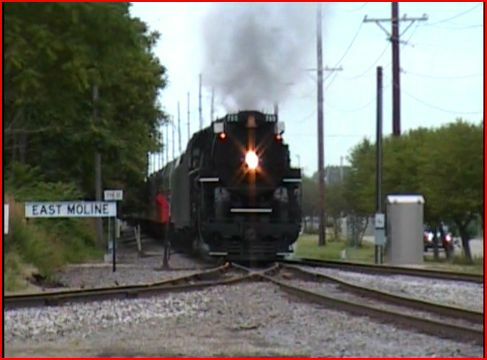 That engine has an Illinois Central whistle, as well. NKP 765 with a pair of Amtrak Heritage painted diesels, for head end power. The Berkshire is great, and does get the lion’s share of screen time in this program. 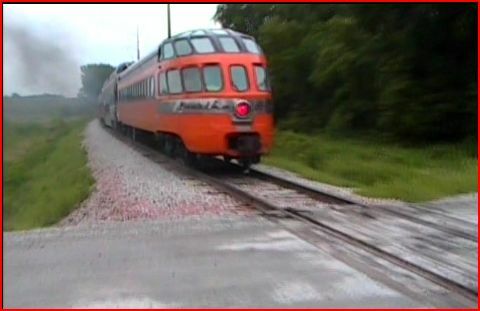 There are a bunch of Milwaukee Road passenger cars behind the 765. Would have liked some background discussion on these cars. 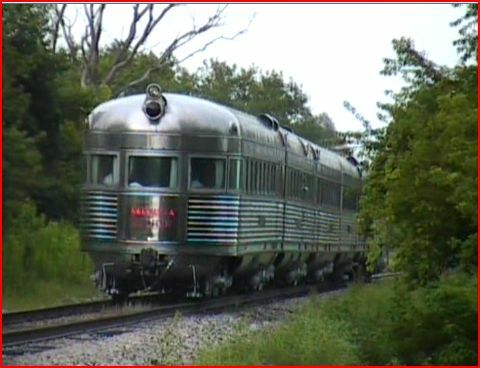 A rare Electromotive built E5 led Nebraska Zephyr, has journeyed from the Illinois Railway Museum to participate. The all stainless consist is just as much a part of history as the steamers. Good historical info on this trainset is included. This program is full of train action! Fine cinematography by Kurt Jensen. Audio is usually excellent throughout. Some wind banging the microphone , but not much. Looks as if much effort went into chasing all of these trains. A smooth running show. Maps would be very desirable, on a program that jumps around as this one does. More narration on the various passenger cars would have been another nice extra. The Nebraska Zephyr is paced. A little rain does not stop the trains. There are a few minutes of 2009 footage from that Train Fest. Southern Pacific and more! Trains On The Mainline At Train Festival 2011. A good train video. Excellent camerawork! 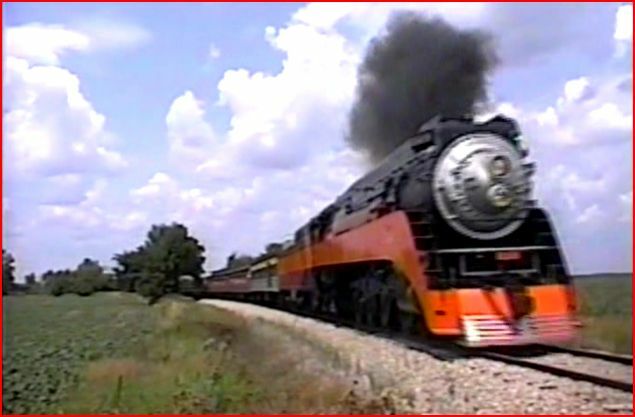 This entry was posted in ATVR Reviews, Diverging Clear Productions and tagged American Train Video Reviews, Railroad, steam train, Train DVD by William J. Hudson. Bookmark the permalink.